Centrefeed Rolls are possibly our Best Selling product due to the janitorial and catering industry we supply and also the cheap case price. 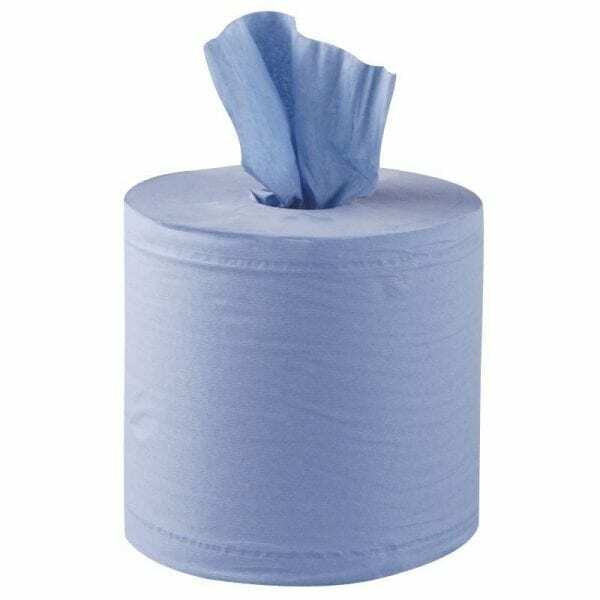 Our 2ply Blue Centrefeed Roll is of a high quality, Glue Embossed and cheap as chips. With 400 sheets per roll, this Pack offers a great case price to re sellers and end users! With 4 buying options including single case, ready made parcel of 6 cases or a pallet deal of 77 cases, this pallet deal offers great savings if you have storage available. For wholesale distributors we also offer container prices. Each Centrefeed roll has a removable cardboard core when used in a dispenser. Micro embossed or dimpled as many users call them are said to improve water absorbency from spillages but in reality, the dimples only puff up a roll to make them look bigger. At Loorolls.com we prefer to offer great savings and always recommend better value. Better value than our 1027 centrefeed rolls is our code 1013 flat sheet blue roll option with 150 metres per roll from our Desna products range. We also offer single, parcel and pallet deals so you can save more. Disposable centrefeed rolls are a cost effective, hygienic way to clean surfaces in your kitchen and in your front of house for tables, windows or any surface. Centrefeed rolls are available in blue or white with blue mostly used in the catering industry and white commonly used in the building trade and manufacturing. Most commonly purchased product for the catering industry has to be our Evans Esteem Cleaner and Sanitiser 750ml that can be used in workplace kitchens in restaurants, cafe’s, care homes any anywhere you need a surface to be sanitised. Why use a blue roll in the kitchen instead of a white centrefeed roll? Mopping up spillages and kitchen waste can be a little messy so when using a blue tissue it almost hides the waste and dirt. White tissue is perfect when using certain chemicals as no dye can bleed from the tissue onto surfaces. If you require any blue or white roll samples please don’t hesitate to get in touch. If you want to know what a centrefeed roll is please check out our blog page or if you want to know more about the paper hand towel v centrefeed hand towel comparison.